Word of mouth is the very best way to get more people to repeatedly come out and see your band play live. When your live show is great, people will love it and talk about you to their friends, both online and offline. The most important thing you can do (individually) to prepare for your gigs is to focus on playing your songs consistently well when conditions are not ideal. To improve this, practice your songs in a wider variety of environments and situations. The more you practice in these different scenarios, the better you will play when it really matters. During your band rehearsals, you should NOT be focused on learning the songs or playing the songs correctly. If your bandmates cannot play the songs flawlessly BEFORE the band rehearses, send them home to learn the songs. Once they’ve done their homework and learned the music, bring them back to the rehearsals. Band practice is not for holding people’s hand through the process of learning the songs. Everyone in your band needs to learn the music on their own. If you have a bandmate who needs your help learning the songs, you can meet alone with that person to help them. However, if this is a consistent problem, you may need to replace that band member with someone who is better (or is less lazy). The purpose of band rehearsals is to get the band to play the songs TIGHT rhythmically, with matching dynamic levels and with great stage presence. will lead you to a big record deal. to prepare for the music industry. Video record your rehearsals. When you watch the video, turn the volume OFF and simply pay attention to how the band looks visually. 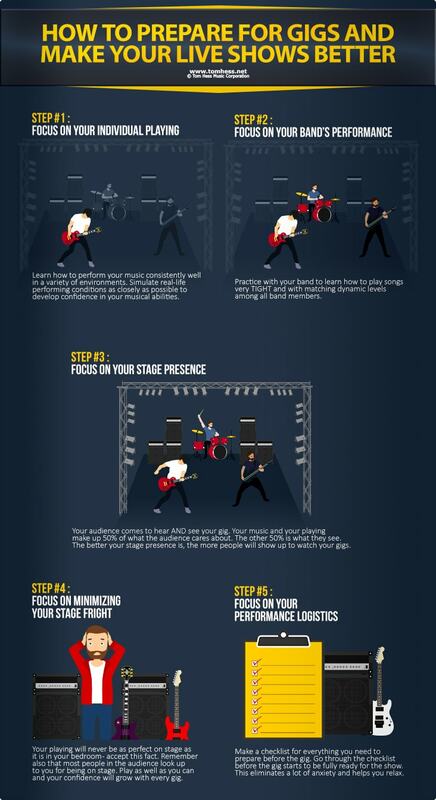 This helps you to focus on stage presence and the visual impact your band may (or may not) have on your audience. Audio record your rehearsals into a computer. Make sure that each instrument is recorded onto its own track (multi track record). Do NOT listen to the audio from the video recording! The first thing to do is LOOK at the recording on the computer screen. You want to notice patterns of rhythmic flaws. Is your bass player always playing slightly before the beat? Is your guitar player always slightly late (playing behind the beat)? For many people it is much easier to see the problem on the screen than to hear it. After you see your rhythmic inconsistencies (if any), you will be able to hear them much more easily. This exercise helps your band to play much tighter rhythmically (which is absolutely critical when performing). Also listen to how the dynamic levels of the band change. Does everyone get louder and softer at the same time? Or is everyone doing their own thing randomly? It almost always sounds best when everyone in the band changes their dynamic level at the same time. 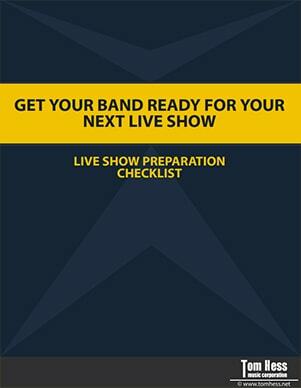 To help you remember what your band needs to do before each gig, download this live show preparation checklist. (It’s free and no email address is required). Print it out and keep it handy, so you always feel prepared for every show. When you play live, your music is only 50% of what most people in your audience care about. The other 50% is what they see. Remember, they came to see and hear your gig. Some great sounding bands often lack bigger success because their live shows suffer from lame stage presence. If you want more people to consistently come out to your gigs, develop great stage presence. Schedule at least 50% of your band’s rehearsal time to analyze your stage presence skills. Watch video recordings of your rehearsals and take notes on what you notice. You can make a lot of improvement through simple self-analysis. Even if you have cool music, a cool band and have prepared well to give your audience an awesome show, all of it can be destroyed by stage fright. Many musicians simply don’t perform well on stage due to anxiety. Don’t let this happen to you and your band. You have worked too hard to let fear cripple you. Your audience deserves better, and more importantly, YOU deserve better! You are on stage to have fun, not to be nervous every moment of the gig. Want to eliminate performance anxiety? Check out this stage fright article to learn how. In addition to stage fright, there are other things that may happen during your gig that can hurt it. The main two issues are: not being able to hear and not being able to see. If you’ve already played gigs, then you know that every gig sounds different. One night you can’t hear the bass, the next night you can’t hear yourself, etc. When you are the opening band, you typically don’t get a sound check before you play. Very often you have no idea what you will be able to hear (or not hear) on stage until you start playing the first song. One of the best ways to prepare for not being able to hear all the instruments is to practice your songs with only ONE other instrument. For example: practice playing only with the bass player. Next, practice the song only with the drummer. This will prepare you for live situations when you can only hear some of the instruments. The next common logistical problem is not being able to see. Live stages are often dark in some moments and extremely bright in other moments. This makes it very hard to see your instrument. My eyes are very sensitive to light, so I always play with dark sunglasses on (since the bright lights often blind me on stage without them). For dark situations, you can add white-out (or glow-in-the-dark markers) on your instrument. This helps you to clearly see what you are playing even in very low light. Plan out a solution for playing in the dark that works for your instrument. Also, practice playing your songs while looking at your instrument as little as possible. This is another great way to prepare for unexpected lighting problems on stage. You now know how to make your live shows go smoothly. The next step to growing your music career is to learn how to get a lot more gigs and earn a very good living as a performing musician. Download this free eGuide to getting more gigs and learn how to build a music career you can be proud of. About Tom Hess: Tom Hess is a guitar teacher, music career mentor and guitar teacher trainer. He trains musicians how to leave their day jobs and build successful fulltime careers in the music industry. Discover how to get into the music business by reading this music career building page now.